Looking for a convenient learning experience? Like the idea of earning your CE in the comfort of your own office or home? 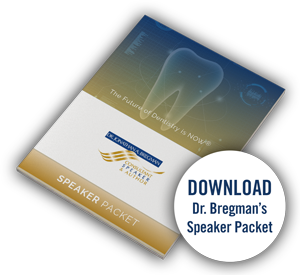 Dr. Bregman’s webinars offer facilitated learning which meets the specific needs of the dentist and the entire dental team. Webinars are a productive and cost-effective method to bring continuing education into your office. As a CERP-certified program, attendees can receive continuing education credits for re-licensure as well. A webinar, using your computer and a speaker phone, is all that you’ll need. After a complimentary ‘mini-consult’ to clarify the goals of the webinar experience, Dr. Bregman customizes his approach to webinar learning so that the specific needs of the dentist/entire dental team will be met — without the stress and expense of traveling to remote locations.